I got back from a conference at my old stomping grounds—the University of Wyoming. 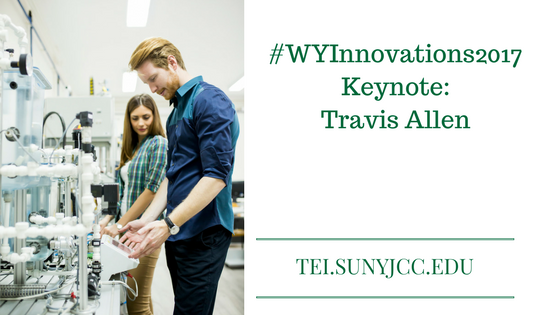 The Wyoming Department of Education (WDE), the Wyoming Distance Education Consortium (WyDEC), the University of Wyoming, the Wyoming community colleges, and school libraries hosted this conference—Wyoming Innovations in Learning. It is an expansion of the e-Volution conference I attended. The focus of the conference is to present ideas for better use of technology in the classroom. The opening keynote speaker, Travis Allen, who is the CEO of iSchool Initiative, set the stage for the rest of the conference. Travis Allen was a bored, disruptive student in high school. He let his feelings be known when he created a video that put him on his path to disrupt education as we know it today. In his presentation, Allen spoke about what he did not like as a student. He offered suggestions for what educators could be doing differently. He wants to change how teachers present content in the classroom and how they use technology. He shared an example of this frustration of using technology in the classroom. He was using technology in the classroom; he was using his smartphone to take notes on a lecture. But this act violated the school’s policy on cell phone usage. As a result, the teacher confiscated his phone. Yet, another student used his phone for nonacademic reasons under the desk and was able to keep his phone. Allen highlighted educators were not preparing students to operate in the real world. There’s an assumption that students know how to use technology. But they don’t. For example, students don’t know how to use social media tools to support their learning. We need educators to help model technology use in the real world. As Allen spoke about Escape the Bus, he pointed out some things that we should be doing differently in the classroom. For one, we need to create an environment that makes students uncomfortable. This is not to put them down in any way, but it is to challenge them to learn. This means we have to do things differently. We have to be less helpful. We need to create situations that involve problem-solving, critical thinking, and risk-taking. We need to create opportunities where students fail. Failure leads to learning. Some students become good at school but that doesn’t mean that they are good at learning. According to Allen, we need to get students, who are primary stakeholders, more involved in their own education. He provided examples such as faculty challenging students to solve institution issues. This has lead to students developing instructional material for faculty and solutions for other students. We need to use the collective power of students to solve issues that are that are facing institutions. We need to empower them to be leaders today. We need to prepare students for the future. Allen highlighted some technologies that are affecting the future. For example, green energy where roofing tiles are generating power. In the area of real estate, you have a 3D house printed 100 times faster than a conventional building. In the area of travel, you can rent a place to stay from Airbnb and catch a ride from Uber, neither company owns the assets they rent. You can even automate your garden. Robotics and artificial intelligence are changing business. We need to prepare students to work in this type of world. Allen stressed we need to develop a lifelong learning mindset in students. This lifelong learning mindset focused on attitude, skills, and tools. We have the right tools in the classroom, we now need to start using them. This means we need to have students use tools to interact with the real world. Students don’t know how to use technology. It’s important that we show them how. If students can Google what you are teaching then you need to teach it differently. Presently, we teach the known world, we need to start teaching about the unknown. Allen offered a novel exercise for faculty. Teach something in the classroom that you have never taught. Don’t prepare, simply start teaching. Show students how you prepare and learn. We need to allow and encourage the use of student technology in the classroom. The internet is a superhighway. If we shut down roads on this highway, we decrease productivity. As it is also reflected in the book, Teaching Naked Techniques, we need to start with the Why. We need to get students excited about what they are learning and show how it’s relevant to what their future. I thought that Travis Allen spoke to this in his presentation. We need to work harder challenging our students. We should not provide them with content that they can look up on Google, but show how this content can make their lives better.